Infant dehydration is the number one killer of children under 5, causing more than 5 million deaths worldwide. Your baby's tiny body has much smaller reserves of fluid than you do, making him that more prone to becoming dehydrated. Keeping him well-hydrated and learning the infant dehydration symptoms need to be at the top of your "To Be Learned" list. This article will tell you what to look for and how to fight back. Here is a list describing the symptoms of infant dehydration. These are the beginning symptoms, the ones that tell you that the doctor should be notified and in-home treatment started. Baby hasn't had a wet diaper in 8 hours (using a diaper tracker is a great help). This is a sign that the kidneys are conserving fluids. A sunken soft-spot (easily felt in first 6 months). Has experienced prolonged, projectile vomiting. Has been vomiting more than 12 hours or has persistant vomiting with diarrhea. Has blood in the vomit or stool. Is becoming more ill over time. If your child shows any of these signs that dehdyration has gotten very severe, call 911 for an ambulance to take him to the Emergency Room. He needs immediate care, and will need to receive intravenous liquids as soon as possible. Baby's feeble cry is more of a whine than a strong wail, moaning and groaning. Marked listlessness, no intrest in play or feeding, little response to being held, and markedly reduced movements of arms and legs. If your baby doesn't show signs of the beginning stages of dehydration above, you can prevent baby dehydration (say, on a hot summer day) by offering more breast or bottle feedings and keeping him well-shaded and protected from the sun. 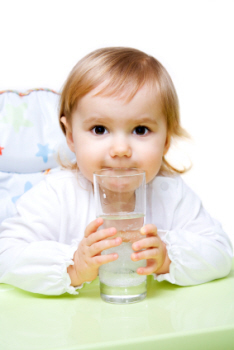 The best solution for baby dehydration is using Oral Rehydration Solutions (ORS) like Pedialyte . Plain 'ole water or other clear liquids have been shown not to be as effective in reversing baby dehydration as these electrolyte solutions. You can give these ORS liquids by bottle, spoon, or even by dropper in frequent small doses. Obviously, if vomiting is a problem, follow these hydration instructions for vomiting. I recommend having a stash of Pedialyte on hand before you spot any infant dehydration symptoms. This way you can start treatment right away, without having to take a trip to the store. If you breastfeed, keep nursing while you offer an ounce or two of Pedialyte. If you bottle feed, use the Pedialyte in place of formula for a while. Do not offer carbonated drinks like 7-Up or Sprite. How much fluid should a dehydrated infant have? The American Academy of Pediatrics has provided the following chart to share just how much fluid your dehydrated baby needs. These are the minimum amounts, so anything over these numbers are a giant cherry on top. Discovering your baby's current weight is simple, and important. First weigh yourself holding your baby. Then weigh just yourself (yes, you have to look). Subtract the two to get your infant's current weight. Infant dehydration is just a symptom. Although infant dehydration is an extremely serious things for infants, unless you've been out in the hot sun all day, it's usually a larger symptom of something else going on. If your baby has been vomiting or showing signs of diarrhea, you need to address those issues as well as the dehydration in order to get him happy and normal again as soon as possible. Watching your infant vomiting is heart wrenching. Vomiting isn't fun, no matter what age you are. But there's something just so wrong about seeing that tiny body convulse to throw up. This is where you step in, Mom, and take charge. And this is what you do. If I had a quarter for every infant thermometer I've purchased, I could pay cash for our health insurance. So writing this article was somewhat selfish. I wanted to get down and dirty into the world of baby thermometers. Pull out the medical research...poll some moms...and see which methods and tools came out trustworthy. Return to the main health section from infant dehydration.